“Miley is a female Black pug. She was born 5/19/2006. Miley is basically blind. She will need another pug in the family so she can follow them around and learn the ropes. Hi everyone! I wanted to give you all an update to let you know how I’m doing. I’ve been at my foster home for a few days now, and it seems to be an ok place. There are squeaky toys that lay around that I love to find and play with and get so excited when I can make them squeak! I get along good with my foster sister, she’s kind of bosy for a pug, but at least she lets me follow her around and play with her toys. I’m working on this whole potty training thing. My foster mom says I’m doing good, I’ve only had a couple little accidents. So far, my favorite time of the day is breakfast and dinner, oh and I don’t mind when my foster mom sits on the floor and rubs my belly, for some reason that puts me right to sleep! I better get going, my foster mom said something about grandma coming over, and my foster sister is all excited. I think I need to go check it out. I’ll write soon! This little sweetie is adorable. Can you fill me in on the potty training….is she working at it, or having lots of accidents. 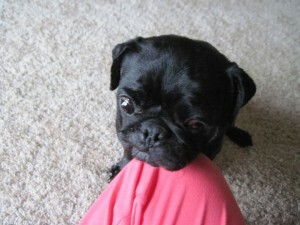 In her foster home, is she with other pugs? and wondered how she is with kids. (I have a 3 yr old grandson and 2 year old grandson) Both have dogs and do well with my pugs, but do get a little over zealous once in a while. What about the skin issue, what is being done and does it affect my other babies? Miley is still at the vet’s waiting to be spayed. Once she is placed into foster care, the foster family will give us an update for her page. Thanks!